There are a lot of reasons why someone who needs a hearing aid won't get one: Some think their hearing loss is not that bad, others are too embarrassed to use them, and many people say they are just not worth the price. Hearing aids cost an average of $1,500 per ear for a basic model, and unlike most technology, their price has not dropped over time. What is worse: Most insurance companies for the devices. Even Medicare does not cover hearing aids — and the Affordable Care Act will not change that. 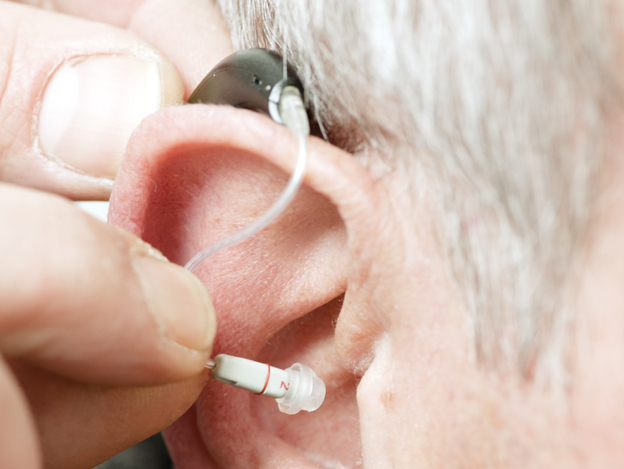 Some businesses see the hearing aid market as an opportunity. Costco has opened hearing aid centers in discount warehouses all over the country. Other companies have started selling their own brands of the devices directly online. Ross Porter, the founder of online retailer , says hearing aids are only expensive because audiologists and distributors charge steep markups on them. But Virginia Ramachandran, with the Henry Ford Hospital in Detroit, says it is unwise to buy a hearing aid for the first time online. She says the device might be fine, but you will not know how to use it correctly. "If someone gave you a laptop computer, and you have never used one before, you would not know how to turn it on, you would not know what programs or how to use them," she says. Besides, Ramachandran says, what really keeps people from purchasing hearing aids isn't the cost — it's the stigma. She led a in 2011 where she divided patients into three groups. The first group could receive their hearing aids for free through their insurance, the second group was partially covered, and the third group had to pay for them out of pocket. Researchers then noted how long it took a patient to get a hearing aid. They found little difference between the groups with partial or no coverage — but there was a "significant decrease in both the age and degree of hearing loss" for those whose hearing aids were fully covered by insurance. Dropping the cost of hearing aids can nudge a senior in the right direction, but there are always going to be people who would rather go without. Ramachandran says that in European countries where hearing aids are covered by insurance, rates of adoption are not significantly higher than in the U.S. She says cost might be a way to stall. "People genuinely perceive hearing loss as being associated with older age, so any excuse not to get them is a good one if it is something that you do not really want," she says. If seniors saw the devices as something as normal as eyeglasses, she says, they would be more likely to get them. This would expand the market and could eventually bring the price down. The industry is already on it: Companies are in the market for to make the pitch.